In the last three month from December 2016 to early February 2017, PT Apexindo Pratama Duta Tbk (“Apexindo”/the “Company”) has received 3 (three) recognition awards for the performance on 3 (three) drilling rig contracts. 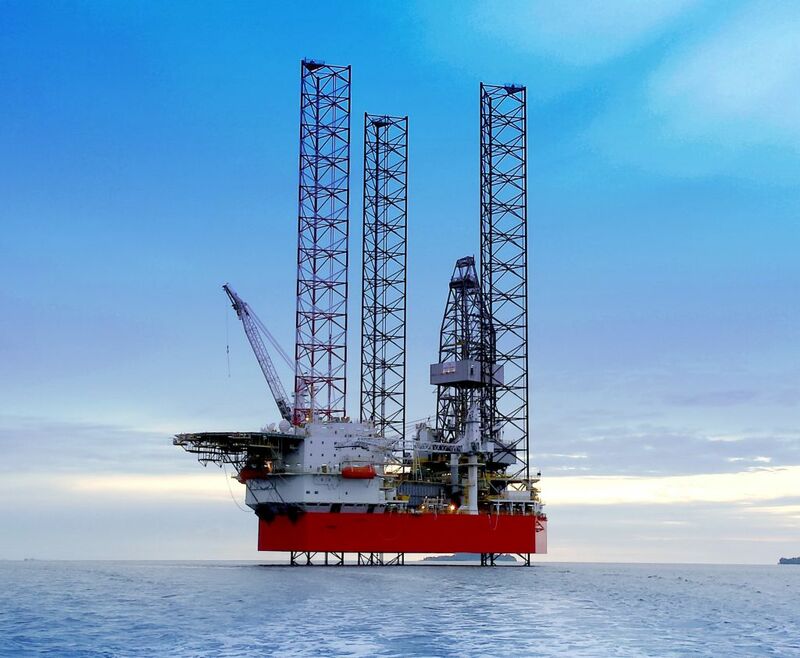 The Company has been given certified recognitions by Petronas Indonesia (PC North Madura II Ltd) for the successful performance of Tasha jack up rig on well BTE-1 and Kepodang project of well KEJT-C3 and KEJT-C4 offshore via Madura; from PHE Randugunting for the outstanding performance of Apexindo Rig 2 on the RGT drilling project onshore in Rembang, Central Java; and from Pertamina Geothermal Energy for the successful operations of Apexindo Rig 4 in drilling geothermal wells in the Lahendong area of North Sulawesi. “These awards are reflections of the reliable service quality provided by Apexindo. During this downturn in the industry, where we experienced a significant reduction of drilling activity, I am proud to see a result of our consistency in maintaining a high standard of services. Our day rates have been reduced by up to 40% if not more in the past few years; however it is our commitment to always deliver the highest performance. We are committed to excellence”, stated Zainal Abidinsyah Siregar, the President Director of Apexindo. Aside of the consistent performance, our knowledge and experience in onshore and offshore operations are a solid base for successful long-standing business partnership with prominent locally based clients in addition to multi-national foreign companies, such as Total E&P Indonesie in Delta Mahakam, and VICO Indonesia in East Kalimantan area where we have been consistently operating rigs for over 25 years. PT Apexindo Pratama Duta Tbk (“Apexindo”/the “Company”) received a recognition award from Petronas Indonesia (PC North Madura II Ltd) for the performance of Tasha jack up rig in well BTE-1. The award is an acknowledgement for the achievement of zero Loss Time Incident during Tasha’s drilling campaign in August 2016 to October 2016. Well BTE-1 is the first well drilled by Tasha, as the rig is contracted for a 3 wells program by Petronas Indonesia. Previously, Tasha was working under a contract with Petronas Carigali Sdn.Bhd. in Malaysian waters since first quarter 2015 and the contract was completed in July 2016. “This award is a result of consistency in implementing safety behaviors which has been demonstrated by the crew. However, this achievement is also a challenge for us to maintain or even improve our performance”, stated Zainal Abidinsyah Siregar, the President Director of Apexindo. 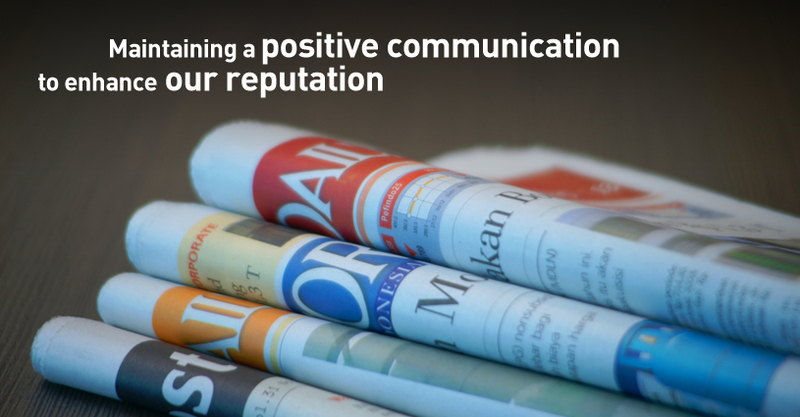 During the years, Apexindo has received numerous awards and appreciation letters from reputable clients for its performance. 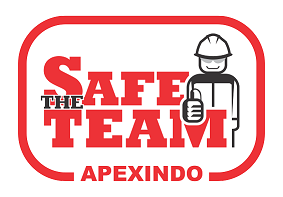 Those awards are a reflection of service quality provided by Apexindo, as stated in the Company’s commitment statement of “Committed to Excellence”, to always deliver the highest performance in order to achieve the Company’s vision and mission. The Management of Apexindo welcomes Chief of SKK Migas, Amien Sunaryadi, at Apexindo's booth during SCM Summit 2015. Attending the event Mr. Irawan Sastrotanojo (President Commissioner), Mr. Zainal Abidinsyah Siregar (President Director) who delivered a brief presentation regarding the Company's asset, including the newly-built rig Tasha. 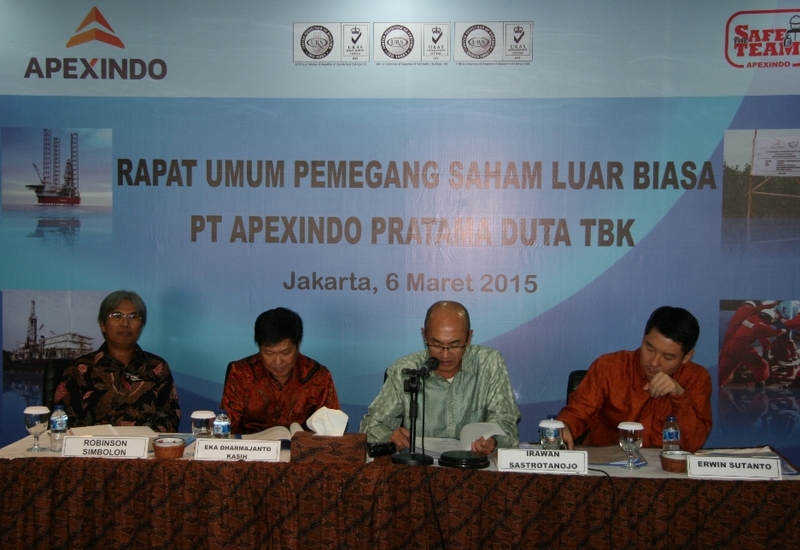 Apexindo held Extraordinary General Meeting of Shareholders (the “Meeting”) on Friday, March 6, 2015 and took place at the Company's Head Office. Attending the Meeting, President Commissioner of the Company Mr. Irawan Sastrotanojo, Independent Commissioners Mr. Eka Dharmajanto Kasih and Mr. Robinson Simbolon, as well as Vice President Director Mr. Erwin Sutanto. The Meeting resulted three resolutions which is provided at Investor Relations page. 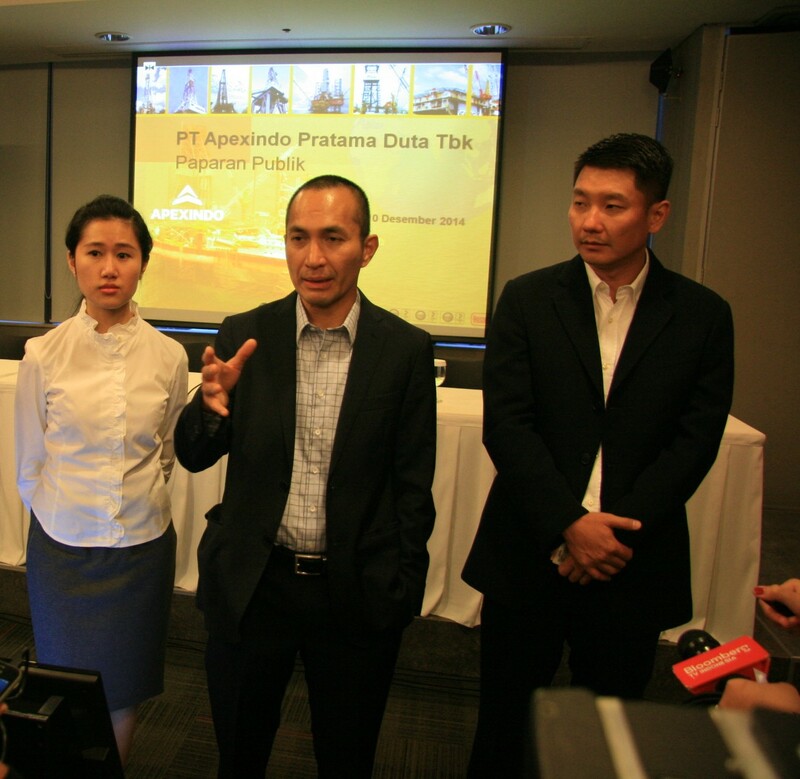 Apexindo held its Annual Public Expose on Wednesday, December 10, 2014 at The Indonesia Stock Exchange Building, attended by Mr. Irawan Sastrotanojo (President Commissioner), Mr. Zainal Abidinsyah Siregar (President Director), and Mr. Erwin Sutanto (Vice President Director). May, 2 - 4, 2018, Apexindo participated in The 42nd Indonesian Petroleum Association Conference and Exhibition which was held at Jakarta Convention Center. Apexindo held its Annual General Meeting of Shareholders and Extraordinary General Meeting of Shareholders on July 27, 2018. The Meeting was attended by Directors and Board of Commissioners of the Company. September 6 - 8, 2018, Apexindo took part in The 6th Indonesian International Geothermal Convention and Exhibition (IIGCE) which was held at Jakarta Convention Center. The event featured various energy companies that focuses on the development of geothermal energy. December 10, 2018-Apexindo helds its Annual Public Expose at Residence 8, Jakarta.